μ-Transfection Kit VI FluoR is the ideal solution where visualization of the carrier system's path through the cell is necessary, for example to gain information about the transfection process. In addition to all the benefits of the μ-Transfection Kit VI FluoR, this kit offers the option of tracking lipoplexes in living cells. For this purpose the transfection reagent METAFECTENE® μ was labeled with the fluorescent dye rhodamine as METAFECTENE® μ FluoR, while retaining its other properties. This enables the transfection process itself to be tracked microscopically. High-resolution microscopic view of HepG2 cells transfected with the μ-Transfection Kit VI FluoR. 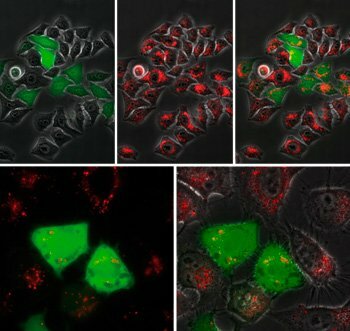 The images clearly show the fluorescent red-marked lipoplexes taken up by endocytosis and the incipient expression of the fluorescent green GFP. (Images of the individual fluorescence channels and layered images). HepG2 cells have been transfected with the plasmid pCMV-eGFP by use of the µ-Transfection Kit VI FluoR (METAFECTENE® µ FluoR, Biontex in µ-Slides VI0.4, ibidi). The film shows an overlay of phase contrast images of the cells combined with fluorescence images of rhodamine-labeled lipid (red channel) and expressed GFP (green channel). Recording began directly after plating the transfected cell suspension and ended 24 h later.